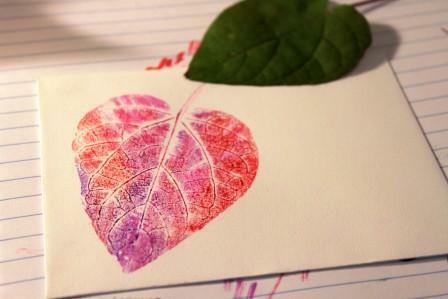 In my last post I wrote about making prints from leaves inked up with stamp pads. I have discovered, however, that I can’t use stamp pads with youngsters. More often than not they will apply so much pressure to the stamp pad that everything that can go wrong does go wrong. 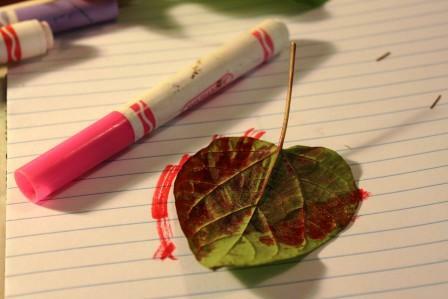 At some point I discovered that standard issue Crayola markers do a fine job of marking up leaves for printing. The most important things about the markers is that they are fresh. If they are dried up at all they just don’t work. It helps if the leaves are fresh, too. I forage around in the grass for volunteers. I will gather tree leaves right from the branches. 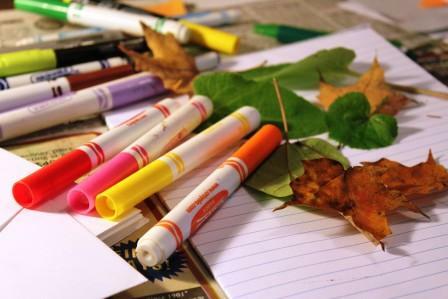 Leaves that are gathered from the ground are dry and brittle, and don’t ink up as well as fresh leaves. 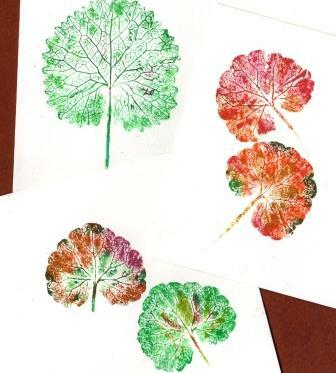 When I know that I am going to be using markers for my inking I look for leaves that are sturdy, like raspberry, burdock, maple, and apple leaves. 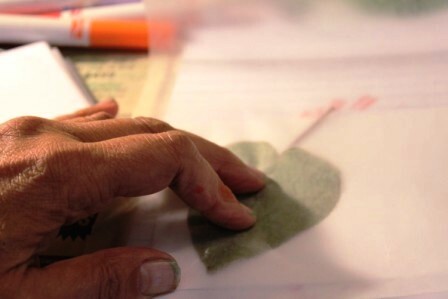 Here’s a catalpa leaf getting inked up with a marker. 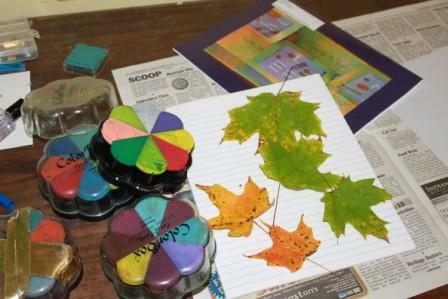 I generally mix colors on each leaf. 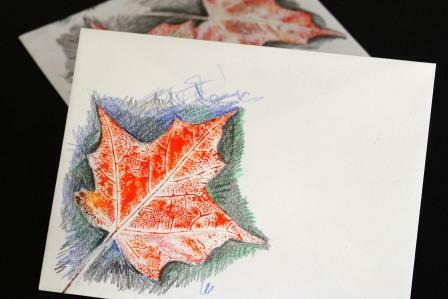 Here’s another most important thing to keep in mind: ink up the BACK SIDE of the leaf: it’s the back side of the leaf that shows all the interesing details. After inking I place the inked side down on a piece of paper, lay some wax paper on top of the leaf and press firmly with my fingers. I give special attention to press my fingers right up next to the veins of the leaves so that there won’t be big white gaps at the spots where the veins meet. I use wax paper on top so that I can firmly press down on the leaf without tearing it. Viola! 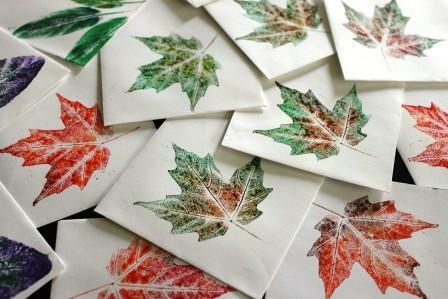 I can re-ink and print each leaf several times before it becomes too fragile. I edited these prints with pencil and colored pencil. See below. 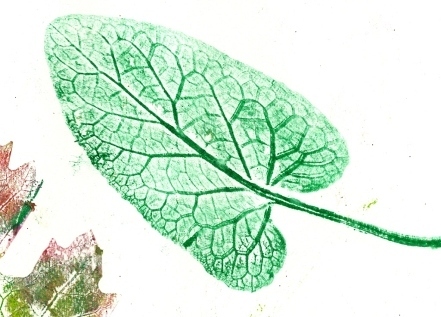 I doctored up this leaf using pencils around the outside as well as the inside of the print. 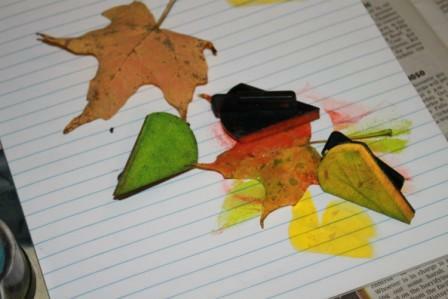 These leaves are from our sugar maple tree out front. Here’s a burdock leaf. These are all over the place, in every size. These are wild geranium leaves. This plant puts out a tiny little purple flower and grows in any available nook and cranny. When it gets inked up it puts out a strong, lovely fragrance. Sage leaves also scent the room when they are being inked. 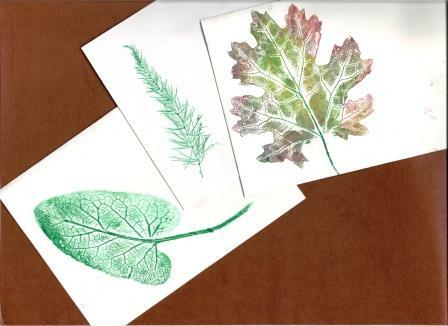 When I do this activity with students I hope that they really notice the different textures, shapes, and smells of the plants that they are using. 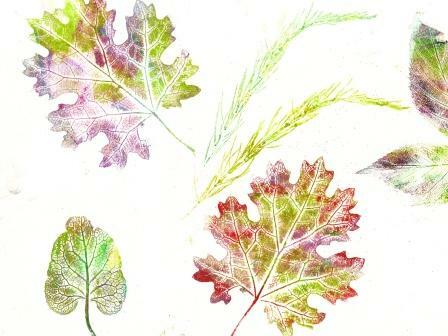 Ferns and wild grape leaves make great prints, too. Unfortunately they are gone from here for the season. The prints don’t always turn out lovely and detailed, but when they do, it’s a real treat. I’ve been in need of some color. 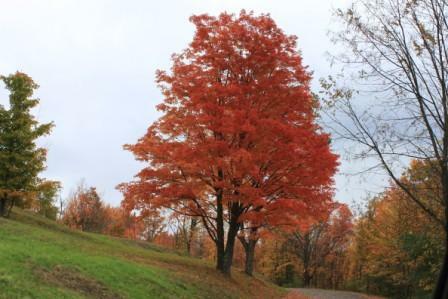 Lucky for me autumn’s colors are peaking here on the NY/ Vermont border. 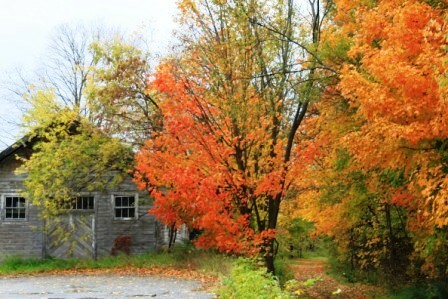 I took a drive, then collected some leaves, wanting to capture the last hurrah of the growing season. There are a couple of ways that I do nature printing. 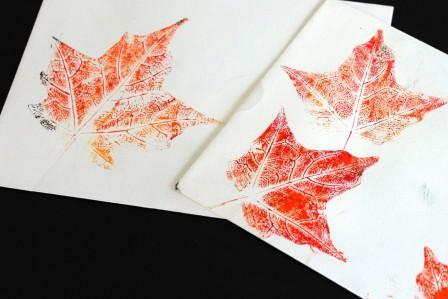 One way is to use pigment stamp pads. 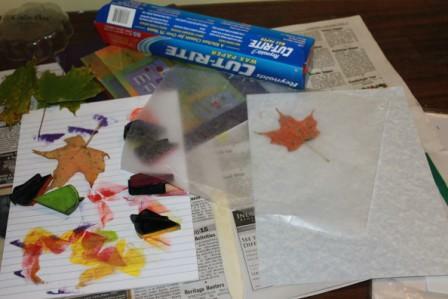 I like these Petal Point sets because it is easy to use different colors on the same leaf. 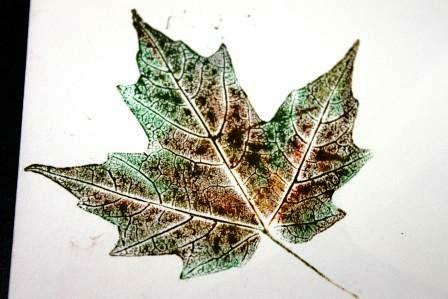 I lay out my leaf with the front of the leaf face down, so that it’s the underside of the leaf that I ink it up. I generally use a blend of colors…. 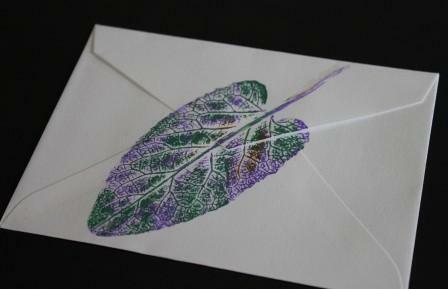 …then lay the leaf, inked side down, on my paper, and cover with some wax paper. Wth my finger tips, I press firmly down all over the leaf. Pressing too hard or too lightly compromises good results, but it’s easy to get the feel for the right amount of pressure to use. 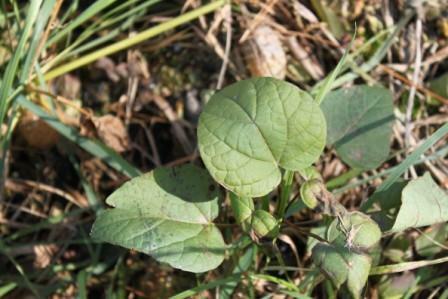 The leaf on the bottom left is a small burdock leaf. The feathery ones are from our asparagus patch. A raspberry leaf is falling off to the right. The fancy leaf is an invasive, tall, beautiful garden plant whose name I forget right now. What all of these leaves have in common is that they have a good bit of dimension. Leaves that are too flat, like clover leaves, just don’t make good prints. Here’s a burdock leaf again. Leaves can be used numerous times before they get too flat or too fragile. Usually, the first print from a leaf doesn’t turn out well for me. So don’t be discouraged if you try this and your first try isn’t great. For me, the best part about nature printing is that when I am choosing the plants to pluck I have to look really closely at what’s growing around me. It’s a fun thing to do in cities, too, as it’s fairly incredible to realize all that can be gathered in a decidedly paved over environment. I think I am going to have to stroll around again tomorrow, before all of this disappears.